On November 5, Wellesley hosts the inaugural Betsy Wood Knapp ’64 Lecture in the Social Sciences. Paul Sabin, associate professor history and American studies at Yale University, will speak on The Bet: Our Gamble Over Earth’s Future. The event will be held at 12:30 p.m. in the Knapp Atrium. During the lecture, Sabin will address the question: Are we headed for a world of scarce resources and environmental catastrophe, or will market forces and technological innovation yield greater prosperity? This is the question Sabin takes up in his book, The Bet: Paul Ehrlich, Julian Simon, and Our Gamble Over Earth's Future, named a Best Science Book of 2013 by the New Scientist. Using as a frame the highly publicized wager between celebrated biologist Paul Ehrlich and iconoclast economist Julian Simon over the future price of metals, Sabin examines the clash between environmentalists and their conservative critics and traces the origins of the political gulf that separates the two sides. 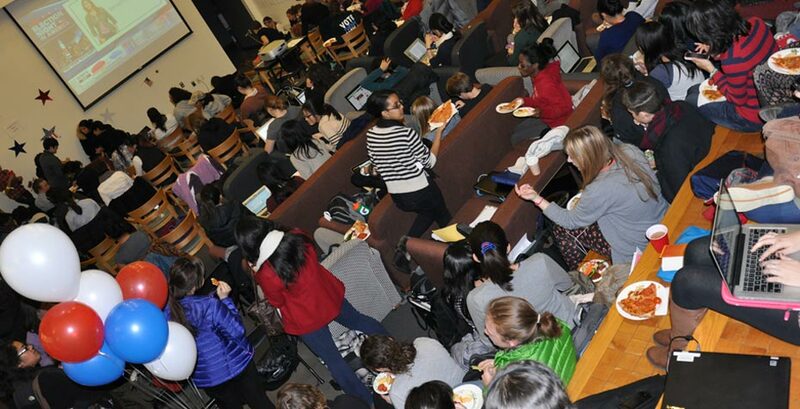 The Knapp Lecture in the Social Sciences is one of the many activities and programs sponsored by the Knapp Social Science Center, established through the generosity of Betsy Wood Knapp ’64. The Knapp Center was developed to integrate the social sciences and serve as a constellation of activity in the social sciences at Wellesley. Its instruction and events connect the intellectual work of social science to its role in the real world. It creates opportunities for students and faculty to conduct social science and interdisciplinary research—both quantitative and qualitative—and to work across department and program lines on issues of common interest. The Center also provides physical spaces, such as the two-story Knapp Atrium in Pendleton East, for specialized programming across a wide spectrum of interests and topics, including the recent event with U.S. Representative Joseph P. Kennedy III, sponsored by the Wellesley College Democrats; a sociology event called "Tian’anmen in History and Memory;" and the Slater International Center’s Latin American Student panel. A hub for research, discourse, and discovery, there is always something new going on in the Knapp Center. "Over the past 15 years, faculty members and students in the social sciences have benefited from the beautiful physical renovation of Pendleton East that happened in the year 2000, made possible in part by a gift from Betsy Knapp,” says Courtney Coile, professor of economics and director of the center. “Since that time, we have aspired to build on our lovely building and the strength of the individual departments and programs within it by establishing a social science center that would provide support for student and faculty research in the social sciences and encourage interdisciplinary exploration of issues such as health and poverty. We are delighted that Betsy has made it possible for this vision to be realized with the establishment of the Knapp Social Science Center. Wednesday's lecture provides an excellent example of the value of bringing an interdisciplinary perspective to critical issues of the day, as we will hear a professor of history and American Studies telling the story of a battle of ideas between a biologist and an economist with implications for today's environmental politics."